Sun. Fun. California. Well, what more to expect from California-based clothing line Crawl Apparel, than colorful T-shirts, fun designs and big prints? Founded back in 2009. Crawl Apparel quickly became well known in the local area, having their fan base ever-growing (4.000+ likes on Facebook is more than respectable number). Recently we had a privilege to try on and review one of their great-looking shirts, appropriately called “Beerscape 2.0”. I must be completely honest and admit I’m not a big fan of big prints and screechy colors. Besides – when Crawl package arrived at my place I didn’t know which shirt they’ve chosen to submit for a review. And when I tore up the envelope I was pleasantly surprised when I noticed one of my favorite colors: blue. Other than that – the print looked very decent, having in mind their latest line was all about graffiti-alike colors. 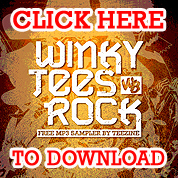 Plus – there is a special feature to this tee, so continue reading. This shirt is of greatest quality. You will notice it on the first look. Both the fabric and print look and feel great. By now I can easily tell it’s an American Apparel brand which Crawl Apparel uses, even though the neck tag is cut off. It’s very soft and a bit thinner, but not that much. It feels great when dressed on and looks really appealing, with many additional prints / details, so all main points are there. In other words – Crawl Apparel means business. Perhaps you wonder why this design is called “Beerscape 2.0”. Well if you look carefully – there are few beer bottles and cans inserted into cityscape, looking like those big buildings whose lights are never turned off. 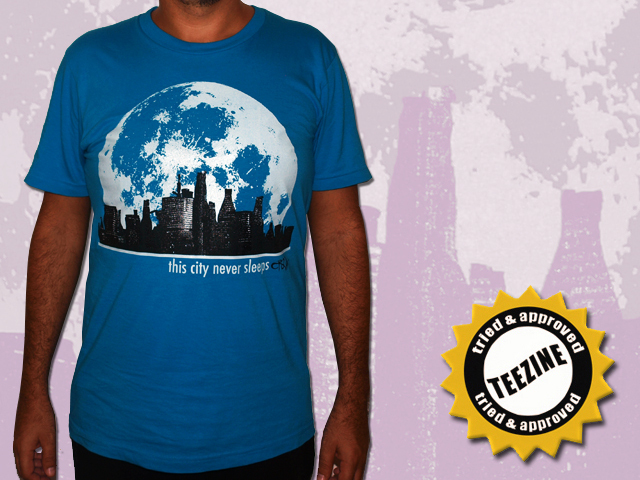 Add a full moon and a slogan “this city never sleeps” – and you have a perfect tee for going out with style! 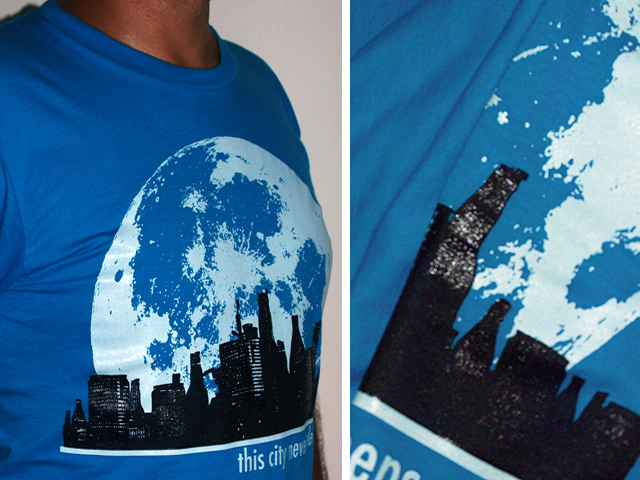 You might also think it’s just white and black colors used in printing of this design, however there is also dark purple (somehow I wasn’t able to catch it with my camera, but believe me – it’s there in cityscape… ummm, I mean – beerscape). And just when you thought it’s all there – Crawl surprises you with a special feature to this shirt, which I usually find annoying. However, here it serves it’s purpose; when in blacklight this design glows in the dark. Still wondering what to wear to the next coed party? I must admit I didn’t try it already, although I wore this shirt a couple of times, but only during the daylight. I’m sure there are plenty of people who dig this effect to their shirts, so Crawl people knew what were they doing with this tee. 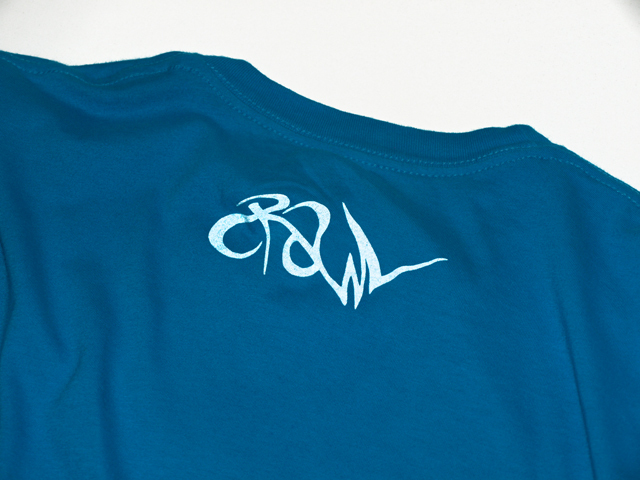 One thing everyone will notice is Crawl Apparel logo on the back of a tee, just below the neck, which is a nice way to introduce others to this brand (since you’re already wearing a shirt that catches everyone’s attention why shouldn’t they know where you bought it). I’ve already stated that American Apparel neck tag is cut off, so Crawl printed another logo on the inside. Looks cool, besides being practical for complete branding of your line. Me likes. Oh, and by the way – Crawl has a new logo (look on the picture at the top of this post), however I like their older logo a little better. Crawl Apparel used screen-printing with this tee, as I am sure they are using for all of their products. If you didn’t know – it’s the most common way of printing because it ensures a years-long durability of applied colors (unlike heat transfers or direct-to-garment printers). As presumed, they’ve also used special glow-in-the-dark colors – don’t worry, they won’t wash away or melt while washing the shirt. 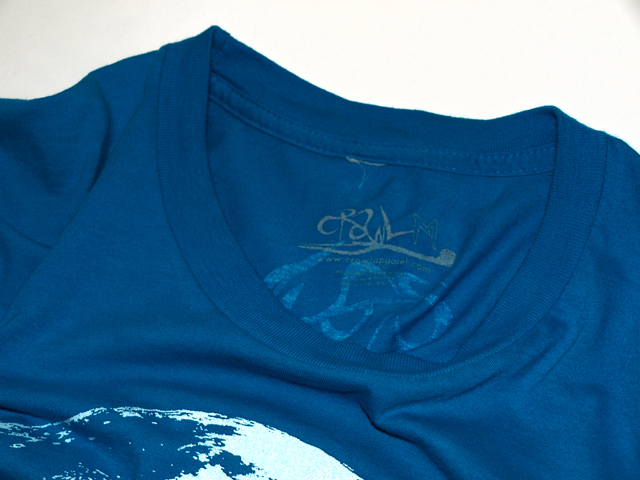 Speaking of which – this tee is to be washed in warm water with alike colors and it’s not to be ironed over the design. If you stick to this you’ll have a shirt of highest quality that will last for years. In conclusion – Crawl Apparel outdid my expectations with this T-shirt. Not that I expected less – it’s just I didn’t expect this much. Highest quality tee and a very nice, fun design printed with special inks and additional prints for more than affordable price (this tee is only $15.00). Plus – if you order from them I’m sure they’ll throw some additional promo items in the envelope (for example I’ve got two ping pong balls with Crawl logo printed on it, along with some stickers). And if you really like Crawl Apparel – you can find some of their stuff also at 14th Street Clothing. Sticking to their goal of creating nice, colorful and fun designs Crawl isn’t crawling slowly to the top of Cali-based indie clothing brands – they are taking real big steps! Make sure you also check out their other products if you don’t know what to wear for going out or just going to the beach. Did you like this T-shirt? What did you think of rest of Crawl Apparel products? I’d love to know, so don’t hesitate to leave your comment below! Thanks!